 <31-Aug-02>: It's been a busy day! A TGV, disabled due to a power cut on LGV Med, has been rescued and space was made in the webTrainSim roundhouse for the CityRail V-set. For those who love the sound of a diesel engine, you'll love the sounds in the cab of the CC 72030 when rescuing the stranded TGV.  <30-Aug-02>: TGV4 - Great Disaster activity on the LGV Med route is now available tgv4.zip (46kb, 29-Aug-02). This is Wolfgang W. Plenz's fourth activity for the LGV Med route. There is some extra rolling stock required - see this page.  <29-Aug-02>: Chris Jenning has released his CityRail V-set in version 1.2a form: vset12a.zip (6.7Mb, 28-Aug-02) (available in the Train-Sim.com file library). Also noticed was a Victorian Rail Steamrail S-class, S313, by Matthew Davis sv_s.zip (604kb, 27-Aug-02; skins only). For a chance to view some well-detailed classic European rolling stock, visit Volker M. Bollig's site at www.vmbollig.de/msts/.  <28-Aug-02>: Luc has started work on developing LGV Med route V1.1. You can read what features he's planning to incorporate at his site. BNSF Brake & Handling Rules: www.bnsf-ttc.com/bnsftime/. Of particular interest is the Montana Division Timetable No. 4, montana012002.pdf document - apart from operating procedures, there are grade charts and maps for each sub-division. Marias Pass is in the Hi-Line subdivision, starting at page 35. Mountain grade operation is on page 37. Brake & handling procedures are detailed in abth021502Amend.pdf. Note: these are the docs which webTrainSim downloaded a couple of months ago - there may be more recent ones. A couple of rules - read somewhere in the above docs - are that you must not have your loco higher than notch 4 across a grade/level crossing, nor must dynamic braking be used across a level crossing. Quite a challenge to comply with these procedures at various crossings on Marias Pass and Marias Pass 3! For more sites, browse the Related Links page. Have you got the TGV Sounds yet? They make TGV-driving a whole new experience. And wondering how to use Triangle des Angles on LGV Med to turn your train at Avignon? The TGV3 - Afternoon Ride activity will show you how. Two trains, meeting at a level crossing, must stop and wait until the other is out of sight.  <25-Aug-02>: webTrainSim couldn't resist Wolfgang W. Plenz's third TGV activity on the LGV Med route: tgv3.zip (42kb, 24-Aug-02) from the Train-Sim.com file library. Check the TGV3 - Afternoon Run page for details on some extra rolling stock you'll need and a small work-around for a freight wagon Wolfgang missed mentioning. While on activities, Felix Hasler has given us an Amtrak Empire Builder (Train 7) activity train_7.zip (663kb, 24-Aug-02) for Marias Pass 3. By now you should have NALW's Genesis packs installed to fully enjoy your trip. Last but not least, you'll probably need ConBuilder to edit the locos in the Player consist.  <24-Aug-02>: For your trams, try the T4D cab, t4dcab.zip (823kb, 06-Jul-02) and the t4D sounds t4dsound.zip (1.6Mb, 16-Jun-02) from Tramworld. Gavin Mclaughlan continues to bring out VR goods wagons, this time VR GH class wheat wagons gh.zip (919kb, 21-Aug-02), gh_dirty.zip (973kb, 21-Aug-02) and a fix in gh_fix.zip (300kb, 22-Aug-02). A reminder that Route Riter rriter35.zip (4Mb, 19-Aug-02), now at version 3.5, is available from the Train-Sim.com file library. This free tool by Mike Simpson is invaluable for route developers to make the download smaller and for those of us with several downloaded routes wanting to retrieve some disk space.  <23-Aug-02>: For some variety, webTrainSim has installed the Number One Tram Route (not_v1.zip, 8.6Mb, 21-Aug-02, in the Train-Sim.com file library). There are eight T4D trams in not_pack.zip (5.3Mb, 21-Aug-02) which webTrainSim has yet to get. A cabview and sound package for these trams are available at TramWorld, www.tramworld.de. Bring up the Zobehor page and look for T4D sounds by Frederic and cabview by Magdeburger. More details in a day or two when everything is running on time. You can see that extra d9_sand.wav so delete them (use CTRL-F to find them). Secondly there are some missing ../..dash9/sound/ folder path specifications missing in both SMS files. Use ConBuilder to check you've made all the necessary edits. webTrainSim found some distortion through his speakers so there needs to be further adjustments made to the WAV files. 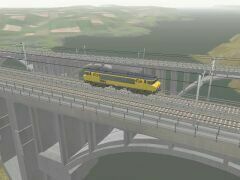  <21-Aug-02>: webTrainSim has rescued the stranded TGV on Viaduc de Ventabren, even after some long head-out driving in reverse to get there. If you're wondering about how to install the Secours TGV - TGV Rescue activity, see the Activities for LGV Med page.  <20-Aug-02>: To help you find the extra rolling stock for activities that are now becoming available for the LGV Med route, look through the page, Activities for LGV Med, for what's needed and where to get them. Two trainsets caught webTrainSim's eye in the Train-Sim.com file library last night: Eurotunnel shuttle trainset leshuttle.zip (10.8Mb, 18-Aug-02) and funky painted Acela trainset acelacid.zip (8.1Mb, 18-Aug-02). There are now a range of freight cars in the Sea View livery, as well as the Soggy Island Express soggye1.zip (692kb, 18-Aug-02) and the Spaulding Island Express spisnex.zip (769kb, 18-Aug-02).  <19-Aug-02>: After bemoaning the fact that webTrainSim's dialup connection from his side of the globe wouldn't enable him to satisfactorily download some French locos and trainsets required for LGV Med activities, the next night online he was able to obtain the rolling stock required for activity TGV1 (tgv1.zip, 38kb, 16-Aug-02 from the Train-Sim.com file library). This is the rolling stock available from the Train-Sim.com file library where the extra bandwidth shouldn't pose any problems: TER X72500 x72500.zip (6.2Mb, 16-May-02) and x72500_2.zip (1.9Mb, 27-May-02), RIO PACA passenger cars riopaca3.zip (457kb, 20-May-02), SNCF BB7200 sncf72v1.zip (1.4Mb, 31-Aug-01). The diesel-electric loco, BB67000 (from Ajouts a Train Simulator at ajtrainsim.free.fr), will surprise you with its detailed cabview and sounds - it's worth having in your roundhouse even if you don't run any LGV Med activities.  <18-Aug-02>: As seen at right, the most pleasing sign for a TGV driver is the one indicating that the 300kmh zone is about to begin. However, it's not always so good trying to get all the rolling stock that a particular activity requires. 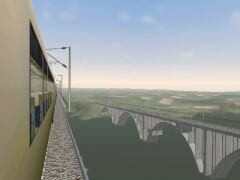 The TGV1 activity, tgv1.zip (38kb, 16-Aug-02) from the Train-Sim.com file library, has two versions of the same activity for LGVMed: one only requiring free rolling stock, the other Clem Tillier's TGV loco pack. But getting that extra, free rolling stock is quite a problem when you're on the other side of the world with a poor dialup connection. That's when webTrainSim decided to put ConBuilder and WordPad to work - in the end, after some editing of the TGV1 ACTivity file, tgv1lt(acela) -first run.act, webTrainSim was able to successfully run TGV1lt. Now, let's see if we can get the other one going!  <17-Aug-02>: Whether Microsoft and Kuju ever thought MSTS would be running trams is doubtful. But innovative modellers didn't take long to build trams and tram routes. 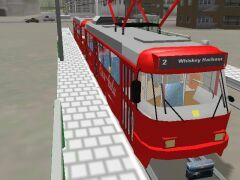 Modern City Tramway version 1 mctv1.zip (12Mb, 16-Aug-02) is one such route, now available in the Train-Sim.com file library. This route's download file has been put together with Route Riter so it's manageable. For a variety of trams, see Tramworld at www.tramworld.de and for more tramways and trams visit MSTS Netherlands.  <16-Aug-02>: The AVSIM TrainSim forum is an alternative message board to that at Train-sim.com. You can ask questions, join in a discussion or just read about MSTS matters. Another site worth visiting from time to time is Microsoft's Train Simulator Insider for tips, free tools and information about railroading.  <14-Aug-02>: A Small World route is at 2,000 km!! Visit the site at http://ronaldus.com/asmallworld/. Some more Australian locos can be found in the Train-Sim.com file library: NR53 TraileRail and NR56 Seatrain braddon2.zip (12-Aug-02, 585kb) by Ben Chatwin and Queensland Rail class 23 qr23.zip (12-Aug-02, 619kb) repainted by Ben Shields. To avoid some download time, webTrainSim installed the Florida Funnel activities NB Amtrak & SB Amtrak from the fun pack, flfunpak.zip then used ConBuilder to change these activities' consists to what rolling stock in the webTrainSim roundhouse. The big problem that ConBuilder can't deal with in these situations is changing rolling stock in loose consists, that is, rolling stock on sidings. Phew, both NB & SB Amtrak activities were Ok. Similarly, ConBuilder was used successfully to change the consists in the LGV Med activity, Acela on the LGV Med, to a Eurostar. However, webTrainSim did notice an Acela, as a loose consist, sitting at Aix-en-Provence or Avignon. There have been a couple of small changes to the ENG files for the Eurostar, Thalys and Pendolino, namely, NumWheels in the Engine section has been changed to a value of 2. Note that NumWheels in the Engine section is a sliperyness factor, not the physical number of wheels on a loco - the latter is covered at the top of the ENG file under the Wagon section.  <12-Aug-02>: Kenji Kimura has provided another TGV cab, this one for the TGV Reseau tgv_rcab.zip (1.2Mb, 10-Aug-02), available from the Train-Sim.com file library. Because it's got the TVM430 in-cab signalling, webTrainSim is using it in his TGV Thalys PBKA (the prototypical Thalys cab has 6 in-cab signalling systems, but not TVM). Rich Garber's Ohio RR route version 9, available from the Train-sim.com file library as small chunks to cater for those with dialup connections, has been removed. Version 9.1 will be posted in the Train-sim.com file library as just a couple of big files. For those of us with dialup connections, Rich will make version 9.1 downloadable from his own site in suitably-sized chunks.  <11-Aug-02>: Some activities are beginning to appear for the LGV Med route - see the activities page at Luc's web site. Both TGV Rescue and TGV-Nice require many non-default MSTS locos and rolling stock, including Clem Tillier's payware TGV pack. Acela on LGV Med uses the default MSTS Acela trainset. webTrainSim installed this one then used ConBuilder to change the Acela consists so he could use the Eurostar for a more prototypical experience. You may want to make a backup copy of the AcelaStd.con consist file (use Explore to copy and paste, then rename the file to something like AcelaStd-orig.con).  <10-Aug-02>: The Florida Funnel activities fun pack flfunpak.zip (129kb, 26-Jul-02) is a collection of 17 activities. webTrainSim has quite easily, taking a few minutes, used ConBuilder to change the consists in the SB Amtrak & NB Amtrak activities to rolling stock in the webTrainSim roundhouse. The south bound Amtrak activity is quite good.  <09-Aug-02>: Jimi Ibbett's Series 30000 railcar s30000v1.zip (4Mb, 07-Aug-02) is now at version 1 and he's put a lot of effort and thought into developing a night cabview as well as the normal one for daylight driving. Remember that there is a large list of MSTS-related sites here on the webTrainSim sites page. Also, there is a railway reference resource section on the same page.  <08-Aug-02>: An updated demonstration version of the Activity Analysis tool actanaen.zip (2.3Mb, 07-Aug-02) is available for download at the Train-Sim.com file library. Peter Harvey has contributed another of his steam loco creations - this time, a LNER A4 Mallard 4468v3.zip (1.9Mb, 07-Aug.02). For those who like railcars, especially any suitable for the Japanese routes, should check out version 1 of the 30000 series, complete with day and night cabs s30000v1.zip (4Mb, 07-Aug-02). In fact, the Train-sim.com file library has had one of its biggest days on 07-Aug-02 for new downloads (about 10 pages), most from one developer.  <07-Aug-02>: The MSTS Netherlands site has the Chris Longhurst's Eurostar and the Thalys PBKA transets (they're both on page 2 of the download section).  <06-Aug-02>: For those wanting to run the TGV Thalys on LGV Med, a page has been added to get you up to speed (pun intended). Here's a good page to view the different TVM 430 signal aspects (text is French). For good schematics of the LGV Med route, visit Florent Brisou.  <05-Aug-02>: The Pendolino tune-up page is now available to give the trainset to more realistic performance. Ben Shields has produced a Y-class steam loco au_y108.zip (7.5Mb, 02-Aug-02) and au_y112.zip (7.5Mb, 02-Aug-02), with an update to the tender ytendfix.zip (109kb, 04-Aug-02). Carlos Gnomes' ConBuilder is now at version 1.5.1 (for those who have v1.4.9 or v1.5.0) conb_151.zip (625kb, 03-Aug-02). Rick Garber's Ohio Rail verion 9.0 is available from the Train-Sim.com file library as several files, all less than 10Mb, for a manageable download for those of us on dialup connections or90_x.zip (where x is 1, 2, 3, ..., 03-Aug-02). However, webTrainSim is still having too much fun with LGV Med! In another day or two, there'll be a page to help you get the best performance from the Thalys PKBA trainset thalys.zip (3.5Mb, 26-Jun-01) and cab tgvcab2.zip (2.5Mb, 25-Apr-02).  <04-Aug-02>: A momentary lapse of concentration (not reason, as the song says) on the LGV Med is all it takes for an overspeed infringement and the consequent emergency stop. Thus far, webTrainSim has not done well on the direct Marseilles-Nimes run. The most recent run resulted in a 10 minute late arrival.  <03-Aug-02>: Just in case you need some help to install the Eurostar to be able to do a 300kmh drive down the LGV Med, webTrainSim gritted his teeth and tore himself away from his cab to write up a page of hints.  <02-Aug-02>: webTrainSim's obsession continues with high speed trains. The LGVMed route is now available - it's a feasible download on a dialup line and easily installed. It's quite a stunning route and its author, Ben Luc, deserves full credit for his work. For more information, including download sites, FAQ, activities, TGV signalling and maps, visit his site at perso.wanadoo.fr/lucweb/lgvmed/eng/. 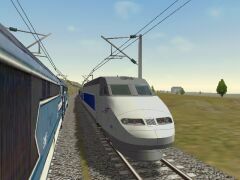 LGVMed is also available at the Train-Sim.com file library lgvmed.zip (19.9Mb, 31-Jul-02). After installation, use Explorer to check the Sounds folder has been created and contains a couple of files; if not, consult the readme for a simple fix. For rolling stock, the best, free choice is Chris Longhurst's Eurostar trainset eurostar0.4beta_setup.zip (1.08Mb, 15-Aug-01); see Chris' site for links to download sites. 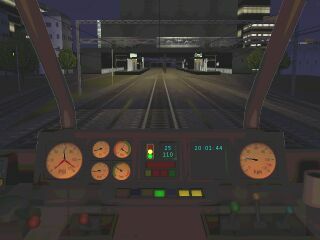 Also, you'll need a TGV cab that displays the TGV style signals: eurocab2.zip (2.05Mb, 11-Jun-02) available from the Train-Sim.com file library. Finally, webTrainSim's Eurostar 18-car trainset is only reaching about 240kmh - he's going to cut back to a 14-car set and do some more investigating of the ENG and WAG files to see what can be tuned. Already he's entered prototypical values for MaxPower, namely 6100kW per ENGine file, not the 12200kW for each ENGine file, as set in the original installation.  <01-Aug-02>: Before you read further, have a look at a cab console at www.raildriver.com. The Florida Funnel route flfunnel.zip (16-Jul-02, 17Mb) has been added to the webTrainSim rail kingdom. With such a dry winter at present where webTrainSim resides, some luscious greenery is a welcome change. Activities yet to be installed include the Florida Funnel funpack flfunpak.zip (129kb, 26-Jul-02) (17 activities, extra CSX rolling stock required) and a CSX passenger activity csx0fcl.zip (24-Jul-02, 966kb). Another route which webTrainSim is keen to add is the LGVMed route lgvmed.zip (31-Jul-02, 19.9Mb) so he can enjoy some high-speed runs. You can read some good information about the LGVMed route at the designer's site, http://perso.wanadoo.fr/lucweb/lgvmed/eng/default.htm. This site also lists alternative download sites, as well as everybody's favourite, the Train-Sim.com file library. It'a also worthwhile reading about the TGV signalling system, among other topics, at the TGVWeb site at www.trainweb.org/tgvpages/tgvindex.html. webTrain Sim was, until recently, part of my webWiz Online site at http://webdotwiz.tripod.com. Due to a reduction in free web space by Tripod, these pages have had to be posted at their own site, http://webDotTrainSim.tripod.com. Not such a bad thing because there's now 20Mb for Train Sim!  Email me at webmaster@webdotwiz.zzn.com if you have questions or comments. I'll try to answer as best I can. Certainly post me if any step-by-step instructions on various how-to pages need clarification.